Beautiful shotgun style in Central City. Fully renovated in 2017. Walking distance to mall and majors fast food. 2.9 miles to French Quarter. 10 blocks from Saint Charles Ave where you can enjoy many restaurants , historical sights, Mardi Gras parade routes and Streetcar stops. Property includes 3 bedrooms 2 bathrooms. Fully furnished kitchen. Living room with Smart TV, DVD player and board games. Wifi available. You can enjoy front and back porch and back yard. 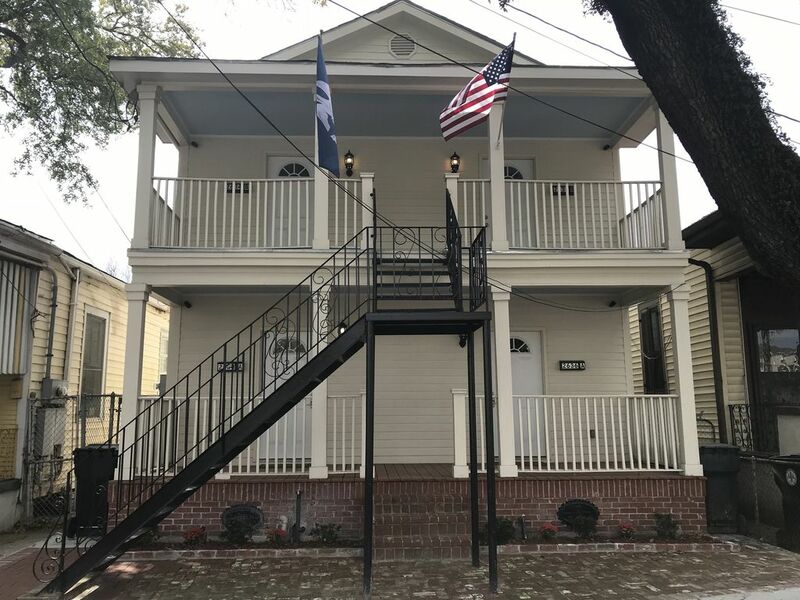 This shotgun unit is located at Louisiana Avenue near Claiborne and has access to many different bus routes and is within 15 minutes walk of the St. Charles Street car and the Garden District. While some reviewers commented on noise issues, we found the unit very quiet. A shotgun unit may not be suitable for everybody, but the unit has two bathroom and offers complete privacy to the occupier of the end unit. The other two bedrooms can be closed, but must be walked through in order to get to the kitchen/living room in front of the house. That said, the unit is very well equipped and even has a washing machine/dryer out the back door. At first glance the neighbourhood is not too inviting, but we felt very safe and also enjoyed the friendliness of everybody we passed on the street. We did not have a car and used public transit a lot, which is very convenient from this location, particularly when using the RTA Trip Advisor. I can certainly recommend this accomodation. House was very clean and updated. Comfortable for group of 6. Lyft/Uber ride for group of 6 ranged $15-20 one way to French quarter. $34 lyft to airport. On a busy street but easy access. Only negative was the fact you could hear everything from the others staying in the other 3 rentals. Very thin walls, but we were aware before renting house. The first impression of the area was a bit startling but after we explored around we felt safe and everyone was friendly. The property was beautiful and clean and stocked well. We had everything we needed. We really enjoyed our stay at this property. It was clean and well stocked. The linens and towels were good quality and there were even complementary items in the home. The only negative we saw was that the communication from the owner was a little lacking, and the $1500 deposit we had to place down ahead of time is taking too long to be refunded which makes this a little more inconvenient. I don't know if this is something that was required because of this property or if it is something new from VRBO. We haven't had to pay a large deposit up front before this stay. We did enjoy this property however, and it is walking distance to many things which was nice. Hi, I’m glad you like the property. Home owners don’t hold the security deposit, VRBO is the one than handle it. Thanks. My group and I were more than pleased with our stay. We appreciated all of the updated finishing throughout the house, as well as, being able to enjoy the patio. It was very welcoming & thoughtful of the owner to provide complimentary snacks & water, along with "just in case" toiletries. We were less than ten minutes from the Super Dome, Canal Street, and The French Quarters. We will definitely plan to return to this property in the future!